This article is focused on specific Russian type of living – communal (or shared) apartments and raise up the question of influence of this way of living on shaping individuals’ belief system. Let me start from the short history of communal apartments in Russia. It is important to say, that “mandatory norm” of living square for one person was constantly decreasing. The government considered that 9 square meters is enough in 1919, but in 1927 this norm was 5,7 square meters. If the room was larger, resident was obliged to find a neighbor during 2 weeks, in other case any stranger can be assigned to live with him or her. Soviet government understood the profit of communal apartments: all residents were under the control. Many reports to the government went from neighbors and often just because of personal reasons when one neighbor wanted to get rid of another one. Communal apartment usually shared between up to seven families. Each family had its own room, which combined living room, dining room, and bedroom for the entire family. All the residents of the whole apartment shared the use of the hallways, kitchen and bathroom. As communal apartments go, the dwellers can easily amount to a hundred. The average, though, is somewhere between twenty-five and fifty. This type of living is still pretty popular among people in Saint-Petersburg. This city is a capital of communal apartment living even today. You can easily find seven or ten-roomed apartments in the city. Statistics says that there are more then 500 000 people live in communal apartments currently. 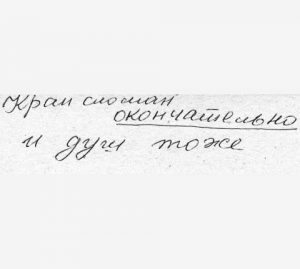 There were many famous Russian writers and artists lived some part of their lives in communal apartments and some of them made notes about that experience. To describe an essence of everyday life let me use a short piece of Josef Brodsky’s writing “In a room and a half”. “For all the despicable aspects of this mode of existence, a communal apartment has perhaps its redeeming side as well. It bares life to its basics: it strips off any illusions about human nature. By the volume of the fart, you can tell who occupies the toilet, you know what s/he had for supper as well as for breakfast. You know the sounds they make in bed and when the women have their periods. It’s often you in whom your neighbor confides his or her grief, and it is he or she who calls for an ambulance should you have an angina attack or something worse. It is he or she who one day may find you dead in a chair, if you live alone, or vice versa. But today not everyone would choose to rent a room even if he or she has a lack of money. What is he difference between those people who would and who would not? Let’s think what values and beliefs are inherent to people who lived in communal apartments or who choose to live there nowadays. 1) Fear of loss, value of preservation and saving. We may also observe the common striving for the state of calmness, stability and peace of mind as a way to save personal energy resources and not to waste them. This is “a way to survive in a resource-constrained environment” and among others it is rooted in communal way of living. The residents of St.-Petersburg are very representative in this way: they have been living in a resource-constrained environment: money is tight, small rooms of public utilities, rare sunny and warm days in line with historical memory of sacrifices necessitated by war, the Siege and deluges. All these factors have shaped a belief that people live in a world with constrained resources which they have to save, preserve and avoid wasting them. This belief also finds a reflection in the specific attitude of residents to their city as of a fixed value in itself: they tend to think about it as of a big museum or memorial which shouldn’t be disturbed or changed but preserved. In the whole, it is typical Russian mindset about lack of availability of resources. The idea of resources creation and their multiplication strike root very hard in Russian mentality. However in Saint-Petersburg this idea is especially strong and viable because of war history, factual lack of some natural resources (climate conditions) and spread of communal way of living. 2) “Nothing depends on a single person”. This mindset means that people tend to believe that social circumstances are stronger than personal efforts of a person. One small person does not possess the power to change something in the “Big World”. People are unable to foresee what will happen in future so there is no sense for them to make efforts, to hurry and be proactive: instead there is always a place for hope that everything comes right by itself and they won’t get lost in the end. But this meaning is not equivalent to the one of nonentity of a human being. It is rather to a greater degree about the idea of destiny where all is predetermined as well as the belief in a higher will and outer world as a whole. 3) “A human being is a nonentity” and there are the outer limits, something bigger than a human being exists. The meanings of these beliefs are connected with previous points: weakness in the face of the government, power of nature and some kind of inner emptiness which is being filled in with being self-associated with great city culture and history which are viewed as something superior to a man. Common resident of St-Petersburg associates oneself with the city. In some cases they would take any critical reprimands for the city personally. High culture and rich history compensate a lack of material wealth. People relate to the city as to museum, the intervention into which is forbidden because this intervention can ruin the unity of the city. This is another widespread mindset significant for Russian mentality: intervention makes things worse. 4) No privacy, no personal borders, private ownership issues. There is no privacy in a communal flat and total intervention in all aspects of private life. Your family and neighbors actually have too much information about you – they know when you leave to work, when you return, they overhear your phone conversations, they see all your visitors, they judge your habits, they see how you dress and they even know which soap you use and how your underwear looks like. So, even if you do not talk too much about your life, they see your life. Usually the way to manage privacy was to maintain privacy in your room and to limit conversations with neighbors. But you have this thought that you have “nothing private” and “nothing belong to me”. These to thoughts can cause different consequences. For example Russian people usually behave as if they are “under the gun” or under the supervision. They always ask themselves: “What other people think about me”. They also can be very judgmental to others: “I know better what is good for you and I will tell you about that right now”. In communal living you can see the life of several other families as an insider, on a daily basis. You see the mistakes they make and privacy boundaries don’t exist. This absence of borders with other people becomes a natural way to live. As a consequence, these people can’t stay alone for a long time – they always need other people. Also this way of living cause lack of personal responsibility for anything which is happening “outside their room” or which is not “directly bothering me”. It is one of the reasons why Russians “common places”, buildings, streets, roads are in really bad condition. 5) One of the most important concepts for Russian people formed in the Soviet period is justice or fairness. It was highly important during interactions in communal flats. Everyone should follow the schedule of cleaning or pay for electricity without cheating. People who have to live with each other and share personal life tried to regulate it with great amount of notes, tables, and letters especially when they didn’t want to talk something unpleasant to each other (see pic. 1-2). Pic. 1 Note: Please do not hang intimate items (underwear and so forth) on the line. You can dry them in your rooms on pipes or on the radiator. This is not a factory dormitory or a collective farm; it’s an apartment in the center of St. Petersburg. Pic. 2. Note: The faucet is completely broken. Coming to the end of this reflection, let’s make some generalization. Many people are looking for the answer about the «mysterious Russian soul» in the works of Russian philosophers and writers. But when they try to apply it to the real Russians, to their Russian guests, it does not work. Because it appears that the owners of this ‘Russian soul’ behave differently in their everyday life and follow different rules from those of the heroes of Chekhov, Dostoevsky and Tolstoy. And if philosophy and literature cannot be the relevant source for understanding Russian mentality, then what else could be? The answer is: in everyday life of people. One should try to find out what principles and beliefs people use every day when making everyday decisions at home, at work or at public transport. And this essay is a try to find out this question. But there is also another point of understanding individual and group belief systems, influenced factors and ways of formation these belief systems or mentalities. When we have such understanding we can develop instruments, approaches and ways of better interactions between cultures, develop methods of social planning and instruments of deep social changes which have a great importance nowadays. Brodsky, J. (1986). In a room and a half. New York: Farrar, Straus and Giroux. Golubeva, T. (2018). 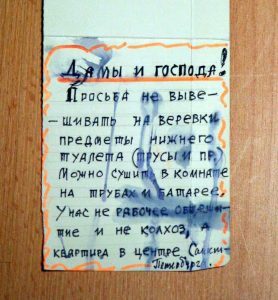 Communal Flats in Russia — Shared Life — Understand Russia. [online] Understand Russia. Available at: https://understandrussia.com/communal-flats/ [Accessed 18 Jun. 2018]. Sharr, A. (2006). Heiddiger’s Hut. 1st ed. Cambridge, Massachusetts: The MIT Press. Utehin, I. (2018). Communal Living in Russia. [online] Kommunalka.colgate.edu. Available at: http://kommunalka.colgate.edu/ [Accessed 18 Jun. 2018].